Reclaimed redwood is popular for both indoor and outdoor projects. 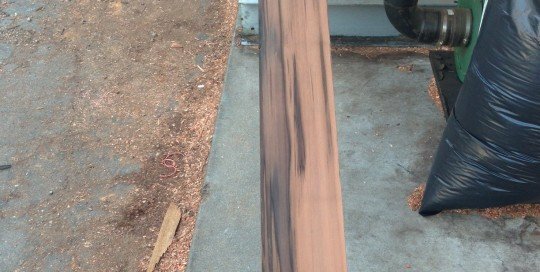 As it ages, old growth redwood continues to cure, acquiring appealing coloration and gaining strength that is not available in today’s new growth lumber. The Lumber Baron has sought far and wide to acquire the best reclaimed redwood on the market. Our reclaimed lumber is all hand selected, providing you with the best lumber money can buy, from locations with historical and nostalgic value. Reclaimed Redwood from Reservoirs – Our reclaimed redwood selection includes a variety of old growth lumber taken from reservoir projects dating from the early 1900’s. The Almaden Reservoir is still in use, but The Lumber Baron was able to reclaim more than 35,000 board feet, primarily 2 by 10 and 2 by 12 sections, which became available after recent seismic activity. Another reservoir in Mountain View, California has provided thousands of more feet of old growth redwood which can be used in its original full 2-inch configuration or milled to your desired size. Redwood from Water and Wine Tanks – Water tanks were once a staple of farms around the country, and the durable, knot-free wood of old growth redwood was a favorite material for building them. Today, the reclaimed redwood is a unique material, often feathery or scaly on one side due to decades of contact with changing water levels and a faded gray on the other. Similarly, staves used in California’s early wineries are imbued with tannins released from the grapes, showing beautiful tinting that is a testimony to the history of the reclaimed lumber itself. Hand Hewn Redwood Timbers – Rough hewn redwood salvaged from old barns is excellent for beams and mantles. This finely aged lumber includes original saw marks and many pieces contain bark from the tree. They can be used in their original 8×8 or 10×14 sizes or surfaced to create a smooth finish suitable for mantles, stairs, and other indoor applications. Redwood from Moffett Field Air Base – The Lumber Baron has thousands of feet of 1-½ by 4 ½ old growth redwood salvaged from Hangar One at Sunnyvale’s famous Moffett Air Field. Originally milled entirely from clear heartwood, this material is both historic and luxurious in appearance, including oxidized nail holes from the original construction. Reclaimed Redwood from Bay Bridge and Pier 31 – The Lumber Baron is proud to offer reclaimed lumber from both the Old Bay Bridge and San Francisco’s famous Pier 31. Both of these Bay Area landmarks were built in the early part of the 20th century using old growth redwood. We were able to salvage 40,000 board feet from Pier 31, which can be purchased in their original 3×4 milled condition or milled to suit. Bay Bridge timbers are 12 inches wide and available in a variety of sizes, including 1-by, 6-by, and 12-by sections, or milled to your specifications. Reclaimed redwood is often taken from massive beams used in old bridges or other major construction projects. These gigantic heartland timbers are not available except as salvaged lumber and cannot be reproduced by today’s young-growth forests. The Lumber Baron has a large stock of reclaimed lumber of this type, which can be used in its original form or milled and surfaced to bring out the original coloring. Perfect for exterior, unpainted siding, interior flooring, or for use as everything from decking to bar tops and kitchen counters, The Lumber Baron offers the best selection and milling options in the Bay Area. The Lumber Baron is your source for high quality reclaimed redwood, Douglas Fir, and cedar. We scour the country in search of antique buildings and major construction projects which are being dismantled or refurbished and choose the best materials for our stock. Available in original milled sizes or re-milled at our location, you will not find a better selection of heartwood and clear lumber reminiscent of a bygone era. We stock new growth lumber as well, but our knot-free reclaimed redwood is in a class by itself, and must be seen to be believed. Do you like all the characteristics of reclaimed material but prefer a cleaner, less weathered, more finished look? Here are a couple examples of what the reclaimed redwood material can look like when it is freshly milled. Our 2x6 reclaimed redwood decking is generally purchased from customer's who we are supplying new lumber to. We hand select the better, usable boards, keeping them out of the land fill. Mostly old growth, they are available with or without knots. They can also be split in half to create unique, rustic siding material.